A large part of the value of a traditional college education is the ability to begin maturing into adulthood in a safe and somewhat supervised environment. Many millennials, products of helicopter parents, are no more prepared to venture into the ‘real world’ at 18 than their parents were at 14. How much is that worth? Incurring six-figure debt, at any point, is a life-changing experience. Doing so before you have any income, experience in the job market, or, most importantly, idea of how much money that really is and what it takes to earn it, can be crippling. That this is the default setting for many high school graduates is not a tenable state of affairs. When the boomer generation graduated from college, they became lawyers and doctors with an abundant future. When millennials graduate, they can look forward to becoming debtors still living in the parental abode. Student loans are shackling many of today’s graduates to decades in debt. Imagine graduating with a $40,000 student loan debt, to be paid off at a 4 percent interest rate in 15 years. That would take $295.88 in monthly loan payments for a total of $53,257.53. 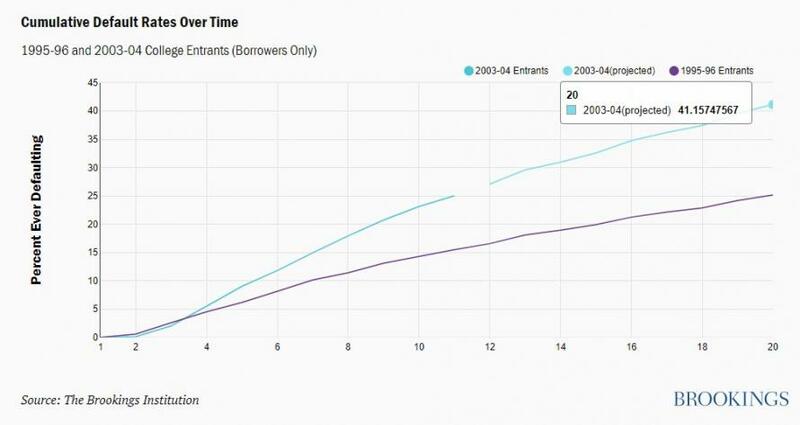 If the same student were to graduate without debt and put that monthly payment in a portfolio yielding 6 percent annually, the youngster would have assets of $86,477.68 at the end of those same 15 years. Student debt makes it difficult to establish any financial stability for years following graduation. The default rate is high, with half of those coming from profit colleges, and a third coming from community colleges. Those continuing to law or medical school find themselves in the worst debt situation, with $100,000.00 in student debt. Baby boomers faced a rosy future that was supposed to be a better one than their parents had. Millennials are facing a mountain of debt and a bleak future. High school seniors are faced with the choice of not furthering their education or going deep into debt. At the same time, post-college salaries in most fields have not kept up, making repayment of student loans even more difficult.